I took this article from “The I Love Dogs” website. I thought it was great information for those of us who love our dogs. I know that I don’t think often enough about the care of my dog’s feet….when I really should. As vulnerable as a human foot, paws need to be taken care of and pampered. An owner wouldn’t walk across a hot parking lot or a snow covered field without the proper protection on their feet. A paw pad needs to be checked for a myriad of issues that should be addressed including nail length, cracked pads and foreign objects wedged in between paw pads. If a dog’s nails are click, click, clicking when she walks or gets snagged easily, then she is in need of being clipped. The nails should barely skim the ground. Most vets offer this service if the owner is too anxious to do it themselves or the dog is unwilling to have it done. The hair in between the pads does cause painful matting if not trimmed regularly. Comb hair out and trim it even with the pads. Check for pebbles or other debris while trimming. Pads do crack and bleed if they get too dry. Don’t use human lotion on the dogs pads, it may soften pads too much and lead to more issues. Instead look into pad moisturizers specifically designed for a dog’s dried out paws. 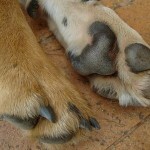 While rubbing in the lotion give the dog a paw massage by rubbing between the pads and up in between each toe. Dogs paws feel heat as much as human’s do on the bottom of their feet. Keep this in mind while out walking during the heat of the summer. To avoid blistering and burning, avoid walking on hot surfaces (such as parking lots or sand) If blistering or burning occurs, wash with an antibacterial soap and loosely wrap with gauze. Excessive exposure to cold weather could cause paw pads to dry out. This will lead to pads becoming chapped and cracking. Another thing to keep in mind during the long cold winter months is lots of people use salt, de-icers and other items to melt ice off of sidewalks. This could be toxic to dogs who like to lick their paws. When coming home from a daily walk, either wipe down or rinse the paws with warm water to wash away any chemical they may have picked up. Another alternative is to slather the dog’s paws with Vaseline before a walk, which will keep salt from getting on the pads or wrestle the dog into canine snow boots. Occasionally dogs will cut the pad of their paw and require some first aid. Clean the cut out with an anti bacterial wash, put some anti bacterial cream on the cut and bandage the paw. Of course that is easier said than done. If the dog is unwilling to have their paw tended too, the owner should do the best they can under the circumstances. Five Benefits Walking Provides Your Pet Is Your Dog Itchy or Your Cat Wheezy?